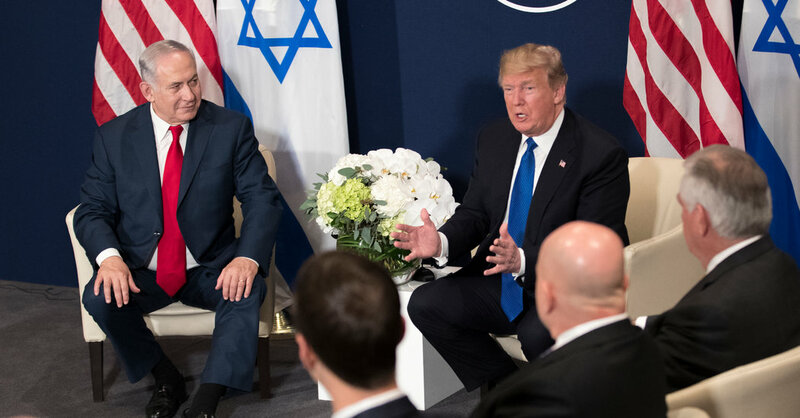 Before his speech to the assembled leaders scheduled for Friday, Mr. Trump used his time on Thursday to meet with Prime Minister Benjamin Netanyahu of Israel as well as with Ms. May. He also planned to attend an evening reception being held in his honor and then be host at a dinner for European corporate executives. The meeting with Mr. Netanyahu showcased one of Mr. Trump’s strongest international relationships. To Mr. Netanyahu’s delight, Mr. Trump recently discarded decades of American policy to formally recognize Jerusalem as the capital of Israel and has also threatened to pull out of a nuclear deal with Iran that the Israeli leader despises. Vice President Mike Pence, during a visit to Israel this week, announced that the United States embassy would move to Jerusalem in 2019. It would be the only foreign embassy in the disputed city, which Palestinians consider the capital of their future state. Rejecting Palestinian protests, Mr. Trump repeated his assertion that recognizing Jerusalem would take the dispute over the city off the table for peace negotiations, an assertion that has puzzled European, Arab and many American political leaders and diplomats. And he again added that Israel “will pay” for getting that concession up front without explaining what he meant. The meeting with Mrs. May was more fraught. While the British prime minister made a point of being the first foreign leader to visit Mr. Trump in Washington after he was inaugurated last January, the two have found themselves on the opposite end of repeated flare-ups. The White House at one point suggested that on behalf of President Barack Obama, British intelligence had spied on Mr. Trump when he was a candidate, an assertion that drew heated objections from London. Mr. Trump accused London’s mayor, Sadiq Khan, a Muslim, of being soft on terrorism by mischaracterizing the mayor’s statement reassuring the public after an attack. And Mrs. May personally criticized Mr. Trump as “wrong” for retweeting anti-Muslim videos first posted by an ultranationalist fringe group in Britain. When Mr. Trump this month canceled his trip to London to dedicate a new United States embassy, he attributed the move to his dissatisfaction with the building project. That explanation was accepted by very few in Britain, where it was widely assumed that he called off the trip for fear of widespread protests. More than 1.8 million Britons have signed a petition calling for a separate invitation for a state dinner to be withdrawn. Nonetheless, Treasury Secretary Steven Mnuchin said the so-called special relationship between the United States and Britain remained undiminished. “I do think we’ve had a very special economic relationship for a long period of time, and we would expect that to continue,” he said. Mr. Trump is only the second American president to attend the World Economic Forum meeting in Davos while in office, after Bill Clinton in 2000. And he comes under radically different circumstances. While Mr. Clinton championed lower economic barriers, no occupant of the White House in generations has been more skeptical of free trade than Mr. Trump. He has scrapped or threatened to scrap trade agreements with countries across the Pacific, South Korea, and Mexico and Canada. This week, he slapped new tariffs on imported solar panels and washing machines. Mr. Trump will discuss those differences when he gives his much-anticipated speech on Friday, but advisers said the plan was not to be belligerent. Instead, they said, he would reaffirm that he believed in robust trade, but that it had to be fair, and that the United States had not been treated well by its partners. And they said he would push for foreign investment in the United States, touting his success at lowering corporate taxes and rolling back business regulations. “The agenda is going to be, again, that the U.S. is open for business, that the new tax law, tax cuts act, makes investing in the United States very attractive,” Mr. Mnuchin said. Still, the administration has spoken with different voices on these matters this week. While Mr. Mnuchin has sought to emphasize potential areas of agreement, Wilbur L. Ross, the commerce secretary, has more defiantly said the United States was ready to wage trade wars. At a briefing on Wednesday, Mr. Ross said other countries had been waging trade wars against America for some time. “The difference is, the U.S. troops are now coming to the ramparts,” he said. At another briefing, on Thursday, he toned that down a bit, saying the Trump administration was not seeking a trade war, but “we’re not flinching from that” either. Despite the doctrinal differences with the Davos attendees, Mr. Trump arrives with a bit of momentum, having pushed through $1.5 trillion in tax cuts, mainly for corporations, and presiding over a growing economy that is nearing full employment. Many business leaders at Davos, while still rolling their eyes at a president they consider erratic and ill informed, are nonetheless happy with his business-friendly policies. Even leaders with grievances against the Trump administration seemed intent on putting aside their differences and playing up to him. Mr. Trump said this month that he would suspend almost all security aid to Pakistan for what he described as the country’s “lies and death,” notably its policies in Afghanistan. Yet, at a dawn breakfast here on Thursday, Prime Minister Shahid Khaqan Abbasi of Pakistan described in warm terms his brief meeting with Mr. Trump in September in New York, at a reception during the annual session of the United Nations General Assembly.